Six people have died today in Mikumi, Morogoro Region, when a car they were travelling in was involved in a head-on collision with a Prince Muro Company bus. The accident occurred around 11:45am when a Toyota Noah travelling from Mikumi to Morogoro town had its front right wheel burst, causing the driver to lose control thus crashing into the bus travelling from Dar es Salaam to Tunduma, Mbeya Region. 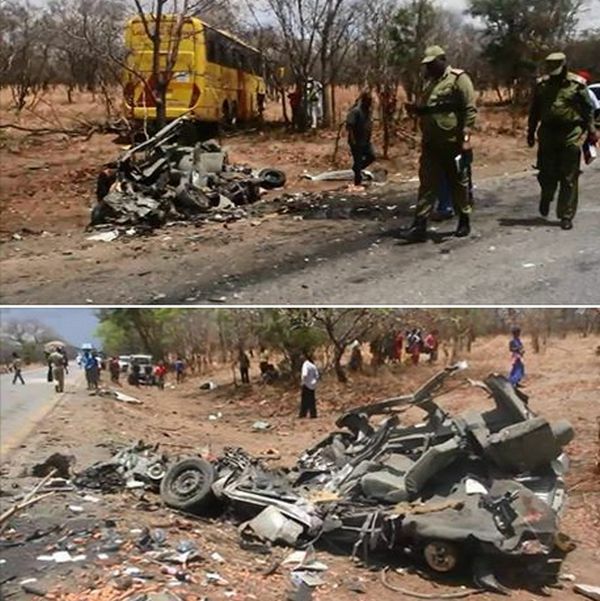 Morogoro Police regional commander Leonard Paul told reporters that all six people travelling in the Toyota Noah died on the spot while some passengers aboard the bus sustained minor injuries. RPC Paul said four out of the six deceased were men while the remaining were women. He said the bodies were taken to Morogoro Regional Hospital mortuary and that the public was invited for identification. The injured from the bus were treated at Saint Kizito Hospital in Mikumi and allowed to continue with their journey. Morogoro Police chief said during a police search, four identity cards were found in the car saying they would help in the identification process. Speaking on the possible cause of the accident, RPC Paul said witnesses accused the Toyota Noah driver of speeding thus losing control of the car after a tyre burst.